ARMED CONFLICT, INTERNALLY DISPLACED COMMUNITIES,LIVELIHOODS AND SUSTAINABLE DEVELOPMENT;One of the issues affecting the people in Africa and other developing countries is armed conflict.In Africa this has been a common occurrence especially in the Great Lakes Region. Many areas have been devastated by civil strife and armed conflict. Countries like Uganda,Sudan,Rwanda,Burundi and Democratic Republic of Congo have suffered for over twenty years.War has resulted into Refugees and Internally Displaced Persons(IDPs). The violence disrupts the economic fabric of the society,its production potential and thus threatening its livelihoods during conflict and post conflict times.The Internally Displaced Persons face Unique Livelihood challenges and their impacts on the environment are many and broad. 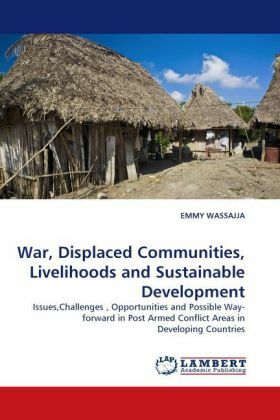 This book explores the livelihoods situation of the displaced communities and in particular ,the transforming processes and structures by which they impact on the environment. This book will provide valuable information for lecturers and students at Universities and Colleges, community development workers and Policy makers , to promote sustainable development in Post Armed Conflict Areas.